At first glance, you might think, "Ah, a yellow baby nursery". 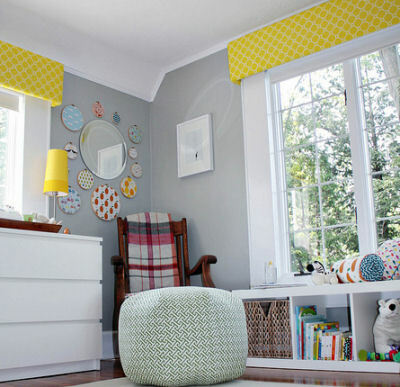 At second glance, "Ahhh, A GRAY and yellow nursery color scheme". Then, if you really, really look you will realize that most yellow baby rooms don't come close to this nursery so far as color is concerned. The most eye catching part of the decor (other than our beautiful baby, of course) that sets the tone for the rest of the room is the bright yellow and white fabric (Dots and Lines fabric by Dolphin and Condor printed at Spoonflower) that I used as the inspiration for my baby nursery ideas and to make my window valances. But keep looking because once you allow your gaze to travel you will see that there is one lively punch of color after the other in our sunny nursery design. After the yellow baby nursery window treatments, were in place it seemed to me that the wall over the crib could use a splash of color to brighten the gray paint color but I already had all the framed prints hung that I wanted. The solution to my problem was the colorful bunting that I made myself using scrapbooking paper, contact paper and spray adhesive. 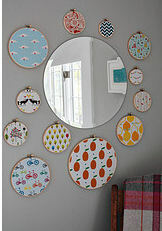 I covered a large area of wall with amazing results and the craft was both easy and cheap! This was not the only part of the baby’s room that I decorated with items that I made myself. I upholstered the rocking, made the crib skirt, made the ottoman myself out of Waverly cross section green fabric that came from JoAnn. PLUS the accent pillows were all made by yours truly from fabrics that I designed and were printed at Spoonflower! I made many of the decorations for our baby’s nursery myself using fabrics in patterns I designed myself or bought from Spoonflower that added so much of the color to what otherwise may have been just another gender neutral yellow baby nursery design. 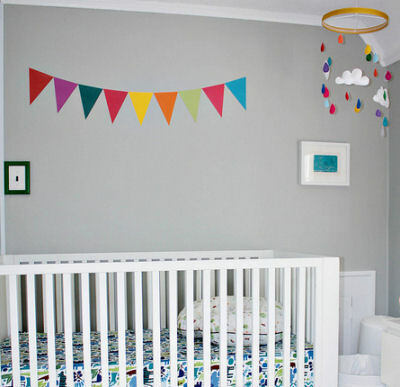 gender neutral nursery ideas with us and for entering our baby nursery pictures contest. I expect to hear that DIY decorators are snapping up the fabrics that were printed by Spoonflower to use in their baby's rooms. And who can blame them after seeing your precious pictures? Comments for YELLOW BABY NURSERY ....NOT! 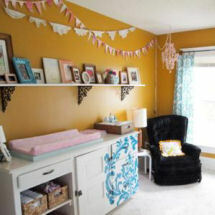 This is THE bright yellow and grey nursery I want! I'm going to do my very best to duplicate it! 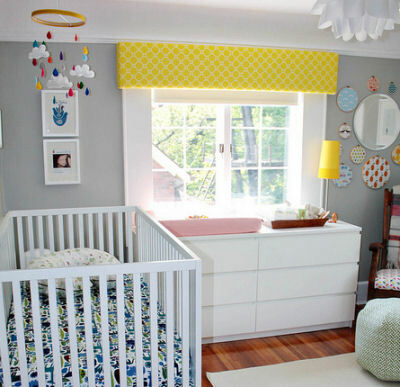 I never would have imagined that a gray and yellow nursery could be so cute! Join in and write your own page! It's easy to do. How? Simply click here to return to YELLOW BABY NURSERY PICTURES and DECORATING IDEAS.